Hi, blogland! Sorry I've been so scarce in my posting lately. I'm working a (legitimate) part-time job from home but have been averaging a bit over my 20 hours. Plus, keeping up with LO while carrying TO ("Tiny One" - in case you forgot!) has kept me occupied more than you would believe! 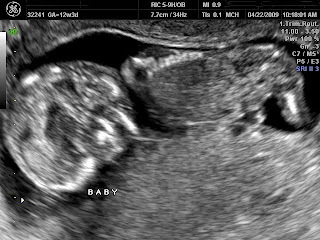 Hubs, LO and I are QUITE excited about the additional family member we're expecting Nov. 1st (or much sooner if he/she cooperates with mommy!). 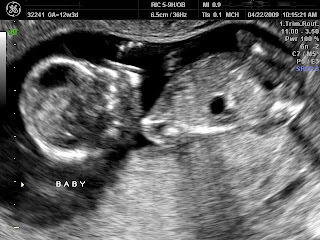 Although I'm currently at 14 weeks, I neglected to post some pictures from our 12-week ultrasound. I am absolutely FLOORED at the 4D images we received. 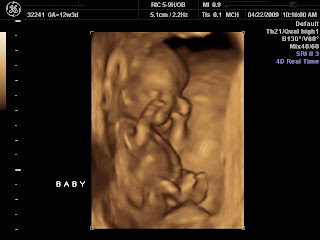 We were able to watch in real-time in 4D as our tiny one moved around, flailed his/her arms and legs, and fought the hiccups! It was amazing! I'm happy to report that the nausea is easing up and my energy level is starting to pick up again (whew!). The 2nd trimester with LO was the BEST and I'm hopeful for the same with TO. Guess we'll have to wait n' see! I'll try to keep my posting a bit more regular and often than it's been in the past few months. I won't lie, though -- your comments are what keep me going! awww! love him/her! are you going to find out?